In many European countries the extreme right have refined their electoral programmes under the rubric of nationalist-populist slogans and have adopted subtle forms of racism. The move away from overt neo-fascist discourse has, allowed these parties to expand their electoral support as populist nationalist parties. Paradoxically, this has led to an increase in racist and anti-Semitic discourse. 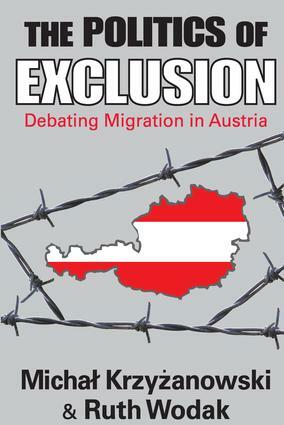 In this on-site analysis, Michal Krzyzanowski and Ruth Wodak describe a confluence of racism and xenophobia, and show how that union creates a new kind of racism. The "new" racism differs from the older kinds in that it is usually not expressed in overtly racial terms. Instead, the justifications that are typically employed concern protecting jobs, eliminating abuse of welfare benefits, or cultural incompatibilities. The new racism exploits xenophobia rooted in ethnocentrism, male chauvinism, and ordinary prejudices that are often unconscious or routinized. For these reasons, the new racism can be defined as "syncretic," a mixture of many, sometimes contradictory, racist and xenophobic beliefs and stereotypes. Racism as ideology and practice is alive and well. This important book aims to provide understanding of the many socio-political and historical processes involved in such expressions of institutional and individual racism--processes which are not necessarily evident from more overt or traditional expressions of racism. This is an innovative look at the political study of language as well as new instances of race, ethnicity, and class in present-day Europe.